Should Kids Use Recorders or Cameras to Monitor Their Teachers? A few days ago, a parent asked how she could prove that her child was receiving instruction from the aide, not the teacher. Another parent suggested that she put a video camera or recording device in her child’s backpack so the child could gather evidence to support the parent’s claim. We NEVER recommend that parents . . . . . . ask, allow, or encourage their children to monitor their teachers. First, you would put your child in the position of spying on his teacher or letting his parent down. Who will he betray? Putting your child in this position would cause incredible anxiety and guilt. Second, if the child is caught (and the odds of getting caught are extremely high), the child will be in very hot water. Third, no one will ever trust you or your child again – and rightfully so. Finally, your child would be viewed as a snitch and a sneak, and may never live this reputation down. Your child would suffer more than you. 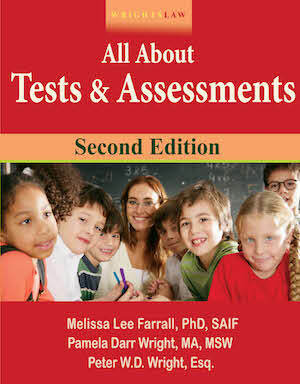 Questions about who is teaching a child and what the child is being taught are common in our cases. There is a simple solution. The private sector expert who evaluated the child observes the child’s program and talks with the teacher. The evaluator has expertise about this child and her needs, the program she needs, if the program being provided is appropriate., if the teacher is adequately trained and is implementing the program properly. 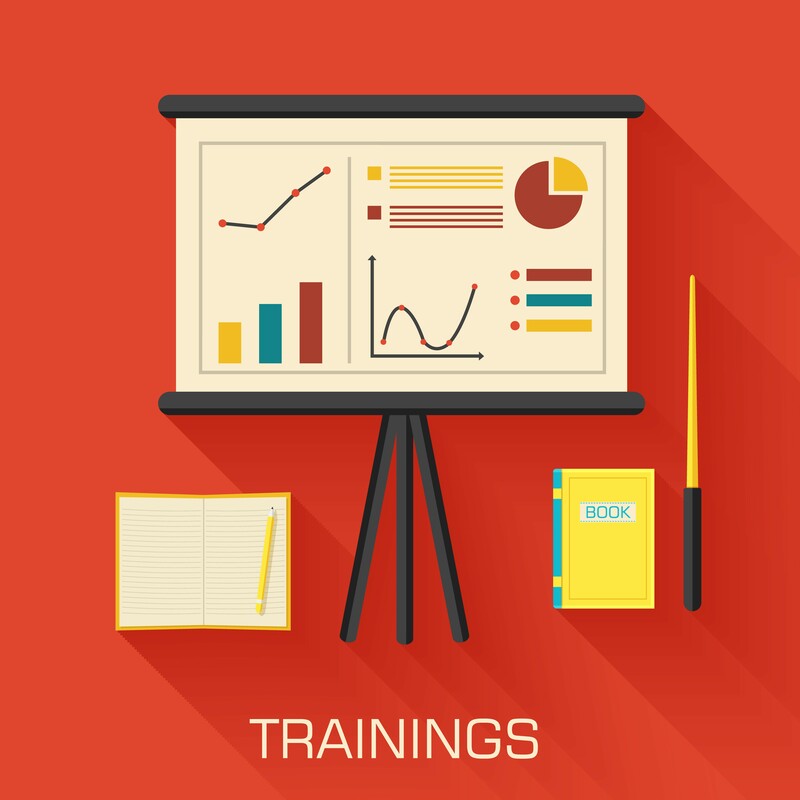 Unlike a parent or child, the evaluator is in a position to provide a report or testimony about the program and how it is being implemented. 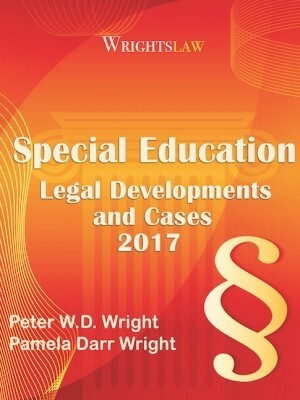 This entry was posted in Advocacy, Confidentiality, General Info, No Child Left Behind and tagged classroom observations, FERPA, observations, parent observations, parental participation, Privacy by Wrightslaw. Bookmark the permalink. My question is they used a flat iron my child burning her hair and neck . And nothing was done and her twin brother told me they pull on her in the hall grabbing her by the arm and squeeze it . When she was having seizure they never informed me and stated she wasn’t listening to them and they would punish her for it. Should you trust the school they take kids that are disabled and pick on them because it harder to prove what’s really going on. so putting a camera on my child seems to be the only way to see and get the evidence need to stop the abuse. In China there are videos in every classroom. America needs the same. Too many teachers are getting accused it could protect them . Also too many students are claiming abuse it would protect them as well. Works in China, teachers always make sure thier lessons and behavior are top-notch. I HAVE A NON VERBAL SPECIAL NEEDS CHILD WHOM JUST STARTED MIDDLE SCHOOL AND RECENTLY SHE STARTED HAVING SEIZURES IN SCHOOL. HER TRIGGERS ARE BEING YELLED AT BUT I CANNOT PROVE IT . I WAS TOLD I COULDN’T PLACE A BODY CAM ON HER .. IS THERE ANY LAW PROHIBITING THIS? Who cares if there Is a law against it? If you have told your child’s teacher that being yelled at triggers seizures, and she is having seizures at school, then I wouldn’t give a hoot about the legality of it and would just do it. If nothing else send in a voice recorder. What? Do you have no concern for the child? Who cares if the child is a “snitch”, if the child isn’t getting the proper instruction, something needs to be done about it. Wow! It’s appaling what little concern you have for the child. What about parents being able to trust the school?! I don’t envy teachers but there aren’t many left that I have respect for anymore. I’m sick and tired of situations like these being about the teachers. This is about innocent children and the lengths teachers will go to, to prove their authority. Children deserve just as much respect as teacher’s and in a lot of cases, more. EVERY parent has the right to know how their child is being treated and it’s sad that parents have to “bug” their child so that teachers will do their damn job! I plan on putting a microphone or camera in my kids backpack without the child’s or teachers knowledge. I don’t trust the teachers, in the last 10 years countless teachers have been found abusing kids, being racist toward kids (black and white), and so much more. So honestly, I don’t care how a teacher may feel… My tax dollars pay their salary. Bottom line. Teachers are “supposed” to be professional. That means – unless they have something to hide – they should welcome being monitored. My son gets picked on cause he is new to school. Teachers tell him to stop being taddle tail when he approaches her. Other say she took him in hallway and pulled him into the doorway and grabbed him by the face. Went to principle and nothing happened. Now two classes he had A’s are C’s. They said he missed some assignments while sick. He asked first day back for the assignments and they told him it was to late. I went and asked they said they had to find the paperwork. Then next day I went online and the missing assignments were marked collected. School should be like old days. Kids pick on you. You take something. Knock the first two out and then fight one on one and take your day or two home. I know. They are told to come forward convening bullying, then they do and this happens. A child at my son’s school was bullied to the point that at the end of last school year he tried to commit suicide at age 13. His mother went to school authorities and they told her “he is just going to learn how to take it. That is not how you handle a bully….you punch them square in the nose! Anyway my son came home after this year’s first day and said the boy had been pushed down that very morning. Wanna know what I did? Bypassed the local BOE and went straight to the state BOE, aND told them what was going on and what the parent had even told. They got back with me the same day letting me know that that was not the way it should.have been handled, and wanting the child’s and bully’s name. But what about the teacher who is being targeted with bad behavior from the student? Should the teacher be able to record the student so others can see the bad behavior? No because teacher’s are supposed to be acting like mature adults! Children miabehave, it’s what they do. Yes, children need to behave. Teacher’s need to stop teaching if they can’t handle the pressure. If you are doing what is right, then you have nothing to worry about. Children on the other hand are still learning right from wrong. The title of this article should be “Be nice to bullying teachers and don’t spy on them”. Their rights override your own child’s well-being. Agreed. Many horrendous acts have been caught by aides/teachers because the parents chose to tape. So your article comes off as more caring about a child being called a liar or snitch then the actual or possible outcome that horrible things are taking place in the classroom? Your article is “inadequate” and contains horrible and flawed thinking. Schools should have CAMERAS installed in each hall, staircase, classroom, and anywhere else that’s legally viable that will serve as evidence. A school will have nothing to fear or hide if they didn’t do anything they weren’t supposed to in the first place. Agreed, this can be legal, after all police officers are public officials and are obligated to be taped. Ellen, Jen, Chris, Janice: I see your points and agree. The original article was written more than 10 years ago. It does not reflect my thoughts today and it needs to come down. When I responded to that email from a parent, it was in a time when we were not aware of the pervasive abuses that occur in schools. Now these abuses are being recorded by Smartphones. We can’t keep our heads in the sand about the fact that we have a serious problem. Today, a too-familiar news story broke. In SC, a sheriff’s deputy / school resource officer grabbed a young teenage girl who was sitting in her desk, tossed her backwards, then dragged her and her desk to the front of her classroom, in front of her horrified classmates. He put his knee down on her, handcuffed her, and arrested her for “disturbing the school.” Apparently, her offense was that she was using her cell phone in class. When her teacher told her to leave class, she did not obey. The girl was small physically. The deputy, a weight lifter and strength coach at the school, outweighed her by at least 150 lbs. This was an abuse of power by a police officer who has a history of this behavior. Just when you think you’ve seen it all, something else, something worse, appears on the morning news. You realize that this isn’t new – no one knows how often these abuses happen. Thanks to the technology in Smartphones, videos are getting out to the public. The genie is out of the bottle. We can’t continue to live in denial about this problem. Regular tape recorders will probably be obsolete if they aren’t already. Thanks for your comments. I’ll leave this up for a few days in case anyone is still following it. There are abuses. What is the solution to unruly students who just want to stir the soup? Their defiant behavior makes it impossible for everyone to learn and participate in class, especially the special education students. Teachers have the responsibility to present engaging lessons but that isn’t always enough. Some student’s goal is to be disruptive. Ignore the phone and they move on to something else. Regardless of their behavior, teachers are held accountable for their learning; not the student and not their parents. So, what are we to do? 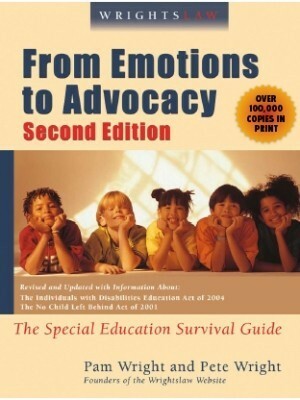 You, miss Rose are ignorant “especially the special education students??! !” Teachers are puppets to their administration. It is not about any of our children’s education. Period. Children misbehaving has absolutely nothing to do with this. Teacher’s CANNOT justify their actions due to the children’s behavior. That’s why they are called adults and children are called “children.” If student’s are misbehaving, there is a way to deal with that and by NO means does that solution include teachers abusing their power and their students. First of all, all schools DO have cameras in every classroom. They can see eveeything that goes on with the teacher or the atudent. They just are more likely to cover their butts when they know they are in the wrong. This is coming from experience and facts. No, not all schools have cameras in the classrooms. Yolanda, First of all you are able to request copies of your child’s records &only pay a nominal fee for copies. .50 cents a sheet is robbery. I hope you have an attorney for the due process hearing. It is difficult to represent yourself. Once the court decides who wins you can never use the evidence that you used on the school again or go to due process for that same issue again. As far as the evaluation goes all requests should be made in writing & you must sign the school’s consent form or they do not have to be complete in 60 days. We found this out the hard way by requesting an evaluation in writing but not signing their consent form. They did not do the evaluation until I found out from someone else I needed to sign the consent form. I was furious with them for not telling me about it. My son’s school will not allow me to view his school records..I requested a due process hearing, which the records were suppose to be sent to me prior to the due process resolution meeting and they weren’t sent. The superintendent informed me the records cost .50 cents per page..I have requested the records twice..by fax, which was dated and stamped. I also, informed the IEP team, which I am experiencing a hardhip, because I only receive assistance from the government, but still have not received my son’s medical records..Also, why don’t ya’ll or anyother special education program offer classes online..I am unable to attend because I have a disabled, who had a malignant baseball size tumor located in the left temporal lobe, which the teacher and para esculates his behavior.I requested a Neuropsychological exam but got no results.. But can a parent use a video recording device to observe their child under the following conditions? : 1) the teacher and the school administration is completely informed that this will be happening; and 2) the device used will not record – it transmits in real time while the parent observes from another room (like a video baby monitor). I would like to do this because I believe my presence in the room changes my son’s behavioral dynamics, but a different person in the room observing on my behalf will not gather the nuances of his behavior that I am trying to learn. Answer: Teachers should use cameras to protect themselves from students… period. Today’s children are disrepectful, rude and have a sense of entitlement as if they know more than their teachers. Today’s children are a threat to teachers and should be stopped. This is stupid. Kids should not carry around cameras or any other recording devices. But they already are! They are called mobile phones that can take pictures, video and sound. I read your article about spying on the school. What does a parent do when you suspect a child is being abused and the school and authorities refuse to investigate. The child come home with bruises and other things? 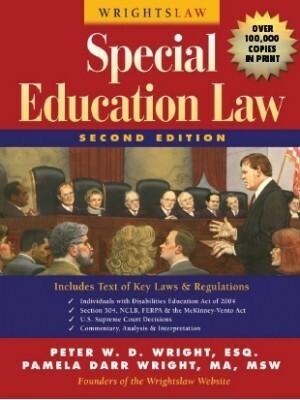 The school attorney is the health and welfare hearing officer so complaints go nowhere there, she is appointed as a special prosecutor for the police so the school resource officers don’t accept complaints because they won’t be found to have merit and is the attorney is on the SEAP and advises the school board tell them it is nothing. She also hires hearing officers to speak at her conferences so getting a fair impartial hearing is out of the question etc. What is a parent to do when there appears to be no hope? We asked for an IEE at the districts expense and they said YES, gave us a list and I called every single one, they either do not do this anymore or have NO time for this now etc etc.. We want this as we know their are “close knit” issues that have worked to our sons great disadvantage, we are following the rules , i even bring snacks , tape the sessions ,all the things my training tells me to do and it does help but there is still one teacher that abused my son for 10 months lied and was caught in her own handwriting , on a book that was passed thru the LEA , US , AND TEACHER every day therefore by law making it a part of his record. When they saw how much evidence against this teacher and how much it showed the lying in her own hand , Spec ed (according to our principle ) , bade him to SHRED the daily book. how do you fight that ? i have a son with PTSD , from abuse surffered at the hands of more than 4 teachers , arms pulled out of sockets ,thrown against walls , locked in closet with a bat. He has had such a bad record of burned out teachers that he does not even tell anymore , he feels this is it …. this is the way it will be for him , school equals pain. We finally got smart and I am studying thru your workbooks etc at home to become an advocate for families and it started to help my son . Low and behold ,he is now in a new school and he has no aide nor requires one (which we have begged at every IEP meeting for three years , he is a safety and getting tested properly for the gifted program , he pretested in the top 4 % in the USA in intelligence and was getting c’s ??? We are happy and so is he Amen. This sounds just like what my son is going through. Can you give me any advice? Please?! Oh please see this…I am going through this as well. PLEASE contact me with some advice. Absolutely not only should the child but the school should monitor the teacher especially when abuse charges have been filed with the state not only to protect the child but also the teacher and the kids would come home with a lot less burses on them. Sad to say the child is not safe in the class room but this is the reality of the new world we are currently living in with random school shooting and cameras are a must in cases like this. That’s a horrible story. I hope you were able to put your son into a safe and appropriate classroom after that nightmare! Some people should not teach. Ettie – You need to make decisions about whether to withdraw your child based on what’s best for your him/her (not your case). 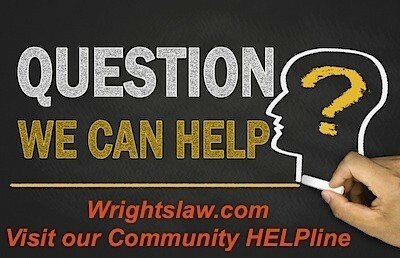 If you have requested a hearing, and your main witness has written a letter saying that the school’s program is appropriate, how will you deal with that? Remember the Rules of Adverse Assumptions – that you cannot testify. How will you prove your case? Although you observed the program (regardless of your observation skills), your testimony will not have the power or credibility as that of your psychologist. 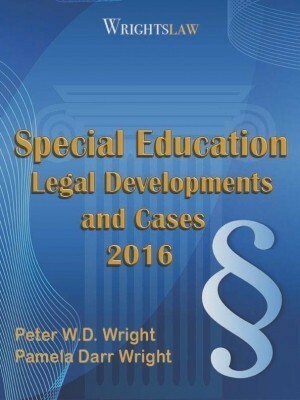 Before going forward, please consult with an experienced special education attorney. My child has attention/borderline auditory processing issues. I observed special ed class – distractions, noise, dual-teaching on two sides of room, etc. 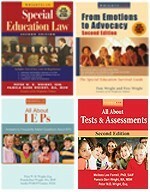 I’m writing spec ed director and plan to place child in home school until he can be placed in general ed with appropriate support. Any advice on whether it is good/bad to pull a child from inappropriate class? Will it hurt/help our case? He’s doing better (As & Bs) in general ed so far. (Ds in noisy spec ed class). Problem: School says I’m “inaccurate” in observing noisy spec ed class. Another problem: my specialist/psych recommended this program in a letter to the school. We took his advice. School has his letter. He says they deceived him about noisy classroom, but is reluctant to write new letter. He still likes this program overall. I have an advocate and will proceed. May not win as ALJ’s have ruled for schools 90% in past 3 years. HELP! I proved this with my son in an IEP meeting. I asked very specific questions about the class I knew the 1:1 was teaching. They had to call her into the room to answer the questions, even though the person who should have been over seeing was in the meeting. This was evidence enough to win our complaint at state level. ADaddy, While I certainly understand your concerns and your frustration(been there, done that, got 9 t-shirts), I have to agree with Karen Z on this one. Due process is so expensive and then what do you get if you do prove your case and win? 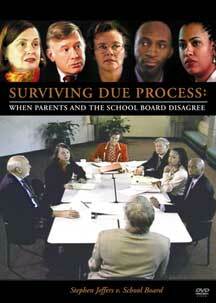 It is my experience that most often times when there is a due process hearing (even though it was put in place to protect our kids), the kid still loses, by the time the district either goes ahead and complies or appeals the decision, the year has gone by and the child pays the price for the parents taking on the school district. Here is what you can do, I take this lesson from the Wrights, Assume that you will go to due process and prepare for the worst, you lay the paper trail so thick that you need rubber boots to wade through it. Call a meeting, ask questions of the aide and the teacher, in a non adversarial way, like what percentage of the time she is with your son or what areas she sees as weknesses or strengths, etc get them to SAY IT, then document it. The playing field is leveled when they know that YOU know and can back it up, that you may be able to go to due process and win. All of this without you ever even uttering the words, due process. You may also want to check the exact language in the IEP regarding the aide, to make sure there is no way it can be interpreted as she will serve the enite class rather that just your son. Good luck to you ADaddy. A due process is expensive and time-consuming. We spent about $27,000 for experts, evals, and attorneys. We did not make it to a full-blown hearing, but chose to have an administrative hearing instead. That saved some dollars. We recouped our expenses for the evaluations, tuition and therapy, plus got about half our attorney fees back from the district – and that’s because we proved our case. However, if you are not able to prove your side, be prepared to kiss that money good-bye! 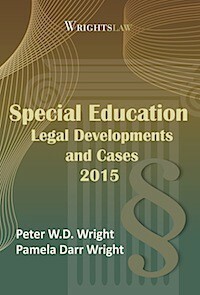 Anytime you bring attorneys into the mix, the school district takes a defensive position. You don’t really want that unless you are willing to invest your money and time. Can you try to meet with them first, or if that fails, use mediation instead? You don’t need an attorney, and it would be less expensive. We are in a situation where the IEP expressly guarantees my son an aide but the school has not provide one. Instead the classroom aide has, “been assigned to …”. It is clear from the difficulties with his behavior that he is not being shadowed. I fully expect that when our IEE assessor observes his class today that the aide will put on a show of staying near him. This doesn’t match my wife’s observations of ‘no aide’ when picking him up. Would I like to hide my digital recorder in his backpack…yes. I don’t do so as the school would argue that I am violating the privacy of the other children and teachers. While I agree ‘bugging or recording’ our teachers by the students is not proper but having a parent ‘observe’ doesnt help either. This just makes the teacher ‘behave’ and make the child sound like a liar when they come home from school. When children come home and report to parents of verbal abuse and shoving by the teacher day after day and the situation is reported and cleared by a ‘close knit school’ and children from years prior have the same stories when asked about this teacher. Tells me ‘bugging or recording’ is necessary. Then again if all classrooms had cameras and microphones ( and recorded/stored) this kind of incident would not happen. Video/audio proof would be there. I am the parent who suggested hiding a tape recorder – as a last resort – to get to the bottom of a problem at school. Understand where I am coming from: In March several years ago, I was volunteering at a book sale at my son’s school while he was in a morning preschool class. I bought some books for the classroom, and walked them down to his classroom to drop them off with his teacher. I was not expected. When I walked into the room, I found my 3 1/2 yr old son STRAPPED by his waist into a wooden high chair crying his eyes out! The aide put my son in a “time-out” and strapped him in. This incident occurred in the midst of our determining that the district had voilated our son’s IEP by changing the classroom to an ABA-type structure without prior notice to the parents. He was having behavioral problems because of this change. Later, the school district filed a Due Process action against us when we tried to get them to revert back to the classroom structure they had in the fall when we enrolled him. We ended up winning, but I’ll never forget my son strapped into that chair. Because he wasn’t verbal, we could not get the full story from him, and relied upon the teacher and aides to communicate with us. Perhaps if I had “bugged” my son’s bookbag, I could have found out sooner what was going on, and saved my child a month and a half of trauma. I’m not saying it would have been the right thing to do, but the administration was hiding what they were doing from us parents. That was the wrong thing to do! 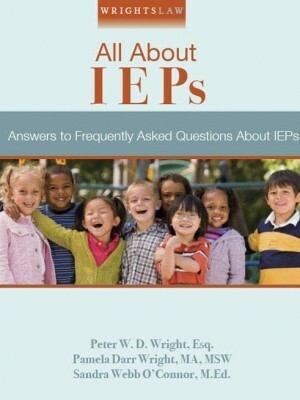 I agree with David, the question is this, “Is the child making progress?” You find this out by getting measurable goals in the IEP and by tracking the progress toward these annual goals. To be quite honest, the teacher (outside the public school system) that finally made progress with my son had teaching credentials that expired two years ago, but was certified in the method that my son needed. While I am not endorsing a teacher not being highly qualified and I think “highly qualified” is important, the bottom line is this……… highly qualified means nothing if you are not effective or have not received the training required to implement a particular program effectively and with fidelity. Personally, I would never want to put my child in a predicament like this, I would just rather track the numbers. The numbers DO NOT lie. The injustice that is done to our kids will not show up on a camera. Documenting and monitoring measurable IEP goals and expectations, will paint quite a clear picture. Baseline IQ and performance data is needed to begin to measure progress. We obtained this information from a local psychologist at our own expense. This gave us non biased measure of reference. As progress or lack of progress is made, you have data that will help you express your concern. I like to compare it to the State Trooper who pulls you over for speeding. He doesn’t walk up yelling and screaming and telling you that he can not believe that you have the nerve to speed when there are laws in place and posted signs that communicate the limits. He/she calmly walks up, gets the proper documents from you, and comes back to your car with a recommended plan of action. The encounter usually ends with the most ironic statement you can imagine, “Have a nice day”. There is little room to be angry at each other if your focus is data driven.